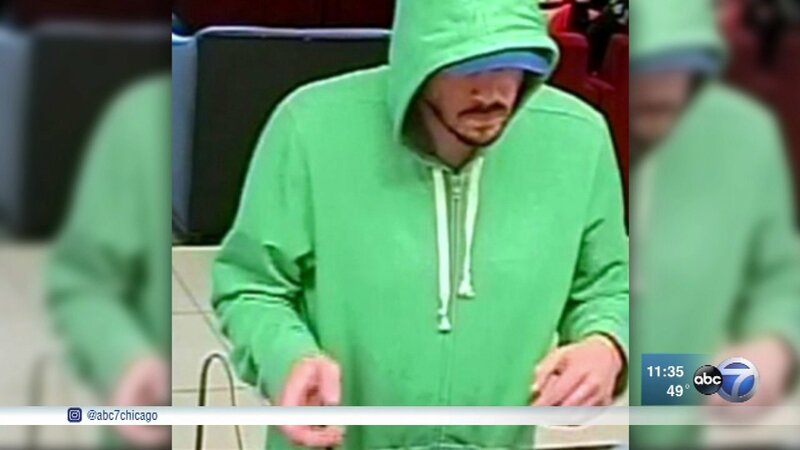 WAUKEGAN, Ill. (WLS) -- A bank in Waukegan was robbed Monday afternoon, police said. Around 4 p.m. Monday, police responded to a robbery at the Bank of America in the 900-block of Waukegan Road. Staff at the bank told police they were robbed. The suspect implied he had a weapon, but did not show one, police said. Police describe the suspect as a white male, about 6 feet tall with reddish facial hair. Police said he was seen leaving the area on foot. Photos show the suspect wearing a bright green hoodie. Waukegan police did not say how much money was taken during the robbery. Anyone with information is asked to call the Waukegan Police Department's Tip-Line at 847-360-9001.